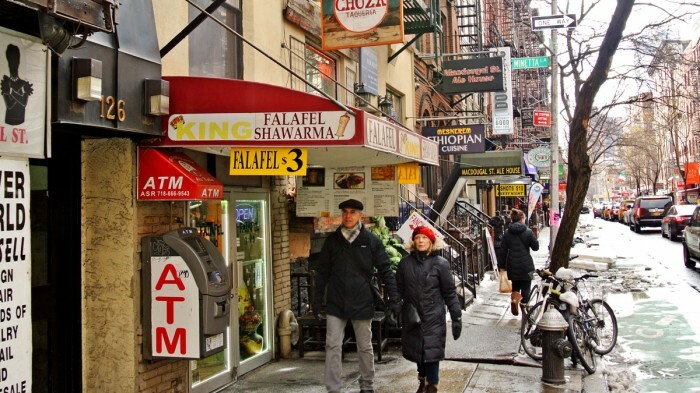 Along the Greenwich Village strip of MacDougal between Bleecker and 3rd Street, there is an extraordinary density of fast, cheap eateries and college-focused sports bars. This probably developed as a direct result of its proximity to the heart of NYU. Even with so many choices, I still always get excited when new additions arrive. 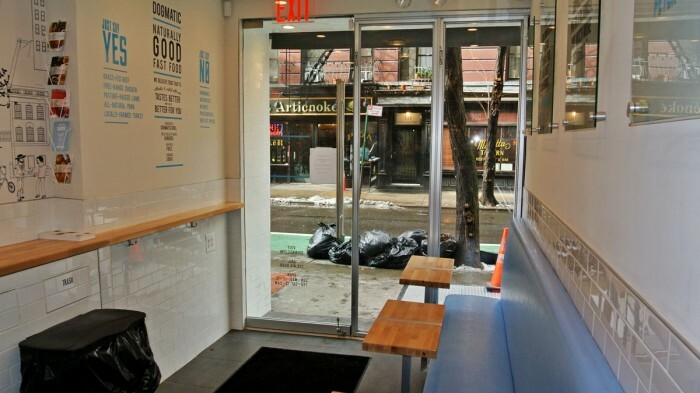 For instance, this week I was treated to the opening of Dogmatic, a diminutive, pristine, bright white, glowing shop with a small and unique menu that recently relocated from the Union Square area. 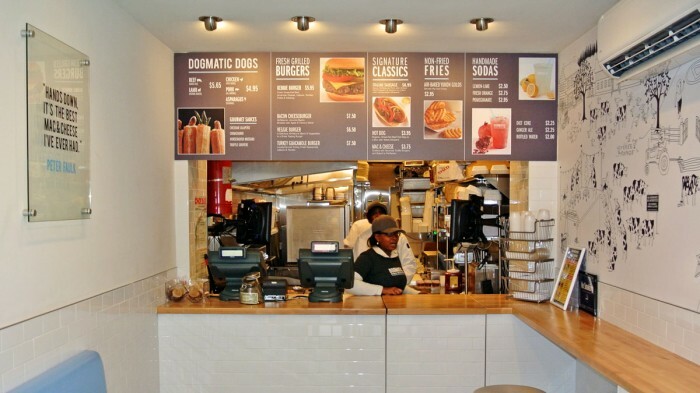 The menu consists mostly of hot dogs and hamburgers and claims to make “naturally good fast food”. 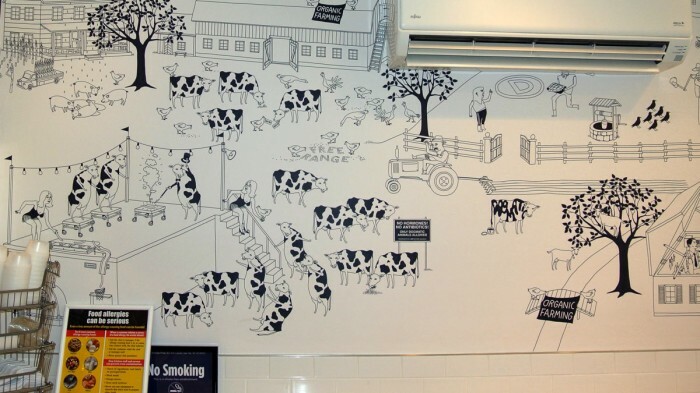 The menu includes hot dogs, sausages, and hamburgers, but really features their original creations, the “Dogmatic Dogs,” which feature a hot dog with your choice of meat stuffed into the center of a French Baguette along with a generous pump of one of their four molten cheese sauces. On this visit I decided to try out their Pork Dogmatic Dog with Cheddar Jalapeño Sauce. The bread has an excellent chewy, fluffy, and crispy texture in all of the right places and pairs very nicely with the meaty, snappy, moist sausage and also does a nice job containing all of the oozy liquefied cheesy that’s been pumped into the bread hole. There is just a touch of jalapeño flavor in the sauce that I wouldn’t mind kicking up a notch, but it still tastes really great with the pork sausage and is really enjoyable. They’ve only been open for a few days, but I’ve already visited a number of times. 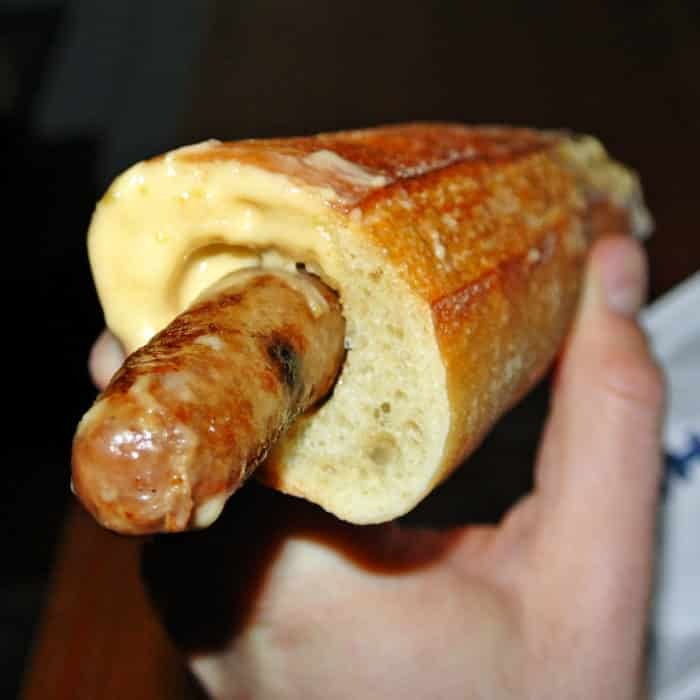 Usually, I opt for the Truffle Gruyere sauce inside my Dogmatic Dog with its rich, deep, funky, burst of flavor, but I selected an alternate sauce this time for good reason. In addition to my dog, I got an order of their Mac & Cheese, which is made with that very same truffle gruyere sauce. This mac and cheese is one of the best versions I’ve had in quite some time. The individually packaged nature of the dish allows a large portion of crispiness to creaminess, which I particularly love. Those crispy edge nuggets of solidified cheese and shell noodles are so delicious, but it also remains extremely cheesy and rich with a nice, strong bold punch of truffle flavor coming through. 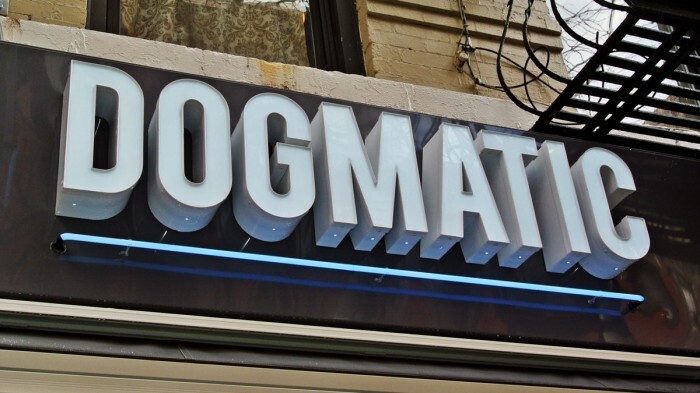 If you’re having a drink in the MacDougal Street area and find yourself needed a quick, delicious bite give Dogmatic a shot. 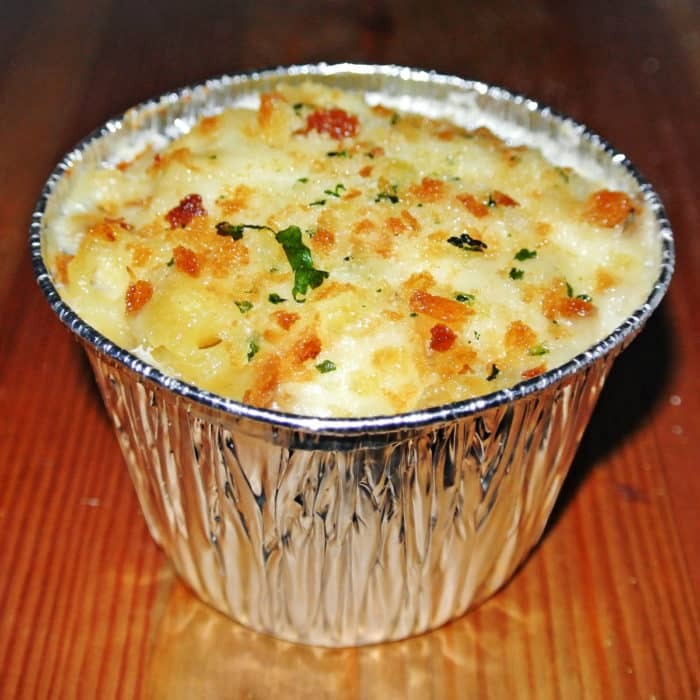 Their Dogmatic Dogs are quite good, filling, and are prepared lightning quick, but make sure you don’t miss out on their truly awesome mac & cheese!